Jim Dodson Law sponsored the Mazda Chilly Willy Duathlon in Fort DeSoto yesterday. 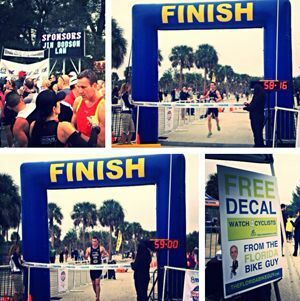 This is the largest duathlon in Florida and it was a huge success. Nick Miehe was the overall winner of the race coming in at 58:16 and his good friend, Nat Glackin, came in at 59:00. Some of the best duathletes in all of southeastern United States were represented and people of all ages participated in the event. We had the opportunity to meet with Florida cyclists and give away free safety information and other items in our continuing effort to promote safe cycling on our roads. Participating and sponsoring events like this in our community provide an excellent opportunity for us to not only meet cyclists but to actually learn from some of the dangers they have experienced while riding. Order a free copy of Jim's book, the Florida Bicycle Accident Handbook, to learn more about what to do in case you are ever involved in a bicycle accident. If you or someone you know has been injured and you would like legal help, call Jim Dodson Law at 727-446-0840 to set up a free consultation.